As a coffee shop owner, I was faced with a dilemma. I wanted my location to stand out and create a brand identity that was second to none, but I also needed to be smart about my expenses. We worked hard on a logo and brand for our business that we were proud of. I remember cutting the logo out and taping it to a blank hot cup sleeve to see how it would look in my customers hand. I had done my research and it told me how important having a logo on the sleeve was going to be - statistically, a customer has that sleeve in their possession for over 45 minutes and it is seen by not only the person drinking our beverage, but on average by 6 additional individuals. Since we were also going to use the sleeve as our loyalty card (punch it 9 times and the next drink is free) that means this little sleeve was going to be seen over 50 times! I had to have my logo on the sleeve! But then I started getting quotes to have them professionally printed. It seemed unending - set up charges, printing charges, multi-case minimums, shipping, not to mention where on earth do I store a pallet of sleeves in my new location where space is at a premium. The sleeve concept that seemed like such a great idea now made my head swim... the options that were available catered to national chains and advertisers, not the small town coffee cafe we were establishing. Being an independent owner, I just did not have the buying power and volume for the traditional sleeve vendor model to work. Ideally, we needed a way to get sleeves with our logo on them but do so without the huge upfront investment and storage requirements. We tried a "homemade" alternative first, buying generic sleeves and a hand stamp with our logo and water proof ink, then, thats right - stamping our logo on every sleeve by hand. It seemed like a more cost effective solution than having them professionally printed, until we factored in out how much time it was taking. But more importantly, the quality of the end result was pretty poor - inconsistent stamps, sometimes blurry or too faint. Not the 'image recognition' I was looking for. While we were searching for better solution a business associate that frequented our cafe was in the process of starting a new local business as well. The idea of 'sharing' the print space on our sleeves put in motion the idea of Coffee Sleeve MoJo - a real solution for anyone looking for small volume, high quality hot cup sleeves just like we were, but with the added service of helping pair up advertising partners and creating a genuine connection between you and other local businesses. It is has been interesting how the local businesses that use our sleeves to reach our customers also tell their own customers about our business, frequent our establishments and use us to assist them when they need the services we offer, like catering and hosting meetings. Just as it is uncanny how many times we are asked to recommend a local business resource and through this process we have learned more and more about what is available for our coffee customers as well. This model has worked for the cafe I own, and Coffee Sleeve MoJo will help you achieve the same results! Our mission is twofold: First, we provide a cost conscious and proven effective avenue for delivering your message to your own market - both current customers and potential customers - through our sleeve service. We help you put your brand image, logo, loyalty program, or other visual/verbal message on an item you already use: hot cup sleeves. We assist with selection of sleeves, refine or even produce a design, and walk you through the process putting you in control of each step through the end result. You can order as little as one case, but we can also respond to orders of millions of sleeves! Second, we assist you in becoming an indispensable partner to other businesses in your local area or region by facilitating their ability to advertise through you - to your mutual customers and your mutual benefit! We work with you to find businesses that are interested in the same clients you are: by geographic location, demographic, choice preferences. We'll match you with them, keeping your costs even lower and providing the participating advertiser with the same effective delivery avenue. 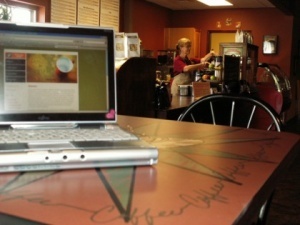 Are you a coffee cafe owner or do you sell coffee at your location? With more than 57% of adults drinking coffee daily, and 67% drinking it weekly, it's a good bet that your customers are many of the same people that other local businesses would like to reach. But because hot cup sleeve advertising isn't limited to the coffee business, our program gives any business, organization, or event serving hot drinks the chance to be the go-to point for area advertisers.